There is this sect of Catholicism called Cafeteria Catholics. These Catholics decide for themselves which doctrines of the Catholic Church they like, and which ones they don't like. The ones they like, they obey and tout to others. But the ones they don't like, they disobey and then they badmouth the Pope and the Church. This is so wrong, because that's EXACTLY what Martin Luther did way back during the 16th Century with his so-called "Reformation." Martin Luther loved all of the dogmas about the Blessed Virgin Mary, including the Immaculate Conception and the Ever - Virgin dogma. But he jettisoned the doctrine of purgatory taught by the church for 1500 years. He had NO authority to do this, of course, but he imposed his personal opinion on his new church named after him. He called the Pope the antichrist, and the Catholic Church the whore of Babylon. In other words, he was one of the world's first "Cafeteria Catholics". Today's "Cafeteria Catholics" are no different than Luther, except they don't leave and start their own church named after themselves. Rather, they very proudly defy the Pope and the teaching authority of The Church delineated in the Catechism. The liberal Catholics love the Church's teaching on social justice and immigration and health care, but they really hate the Church's teaching on artificial contraception and abortion. So they, in effect, are their very own Popes, deciding infallibly for themselves what is right and what is wrong. And worse than that, when it comes to voting, they will vote for someone who promotes abortion and contraception as being normal, right, and good. On the other hand, the Traditional Catholics love the Church's teaching on the Eucharist, the angels, the Mass, etc., but they reject the Pope himself, because of the "new Mass". These Cafeteria Catholics only want the Traditional Latin Mass, and believe in their heart that the new Mass is heretical , and doesn't fulfill the Sunday obligation. They refer to the current Pope as Pope Ratzinger, instead of Pope Benedict XVI. These sedevacantists believe that the Chair of Peter has been vacant since 1958, when Pope Pius XII died. Both of these types of Catholics are heretics. We as the laity don't get to pick and choose which doctrines of the Church we get to believe in, and which ones we don't. Jesus started the Catholic Church back in 33 AD, he gave the keys to the Kingdom to Peter, who passed down the authority of the Keys to his successors throughout the ages. Jesus said that the gates of hell would not prevail against His Church. To believe that there have been no Popes since 1958 would indeed mean that the gates of hell succeeded against the Catholic Church. Jesus also promised the Holy Spirit to guide the Church in truth. To believe that the doctrines of artificial birth control and abortion are in error means that you believe the Holy Spirit somehow made a mistake in giving these doctrines to the Church. And that sounds a LOT like what Martin Luther thought about Purgatory. It's all or nothing folks. The Catholic Church is not a church for wimpy people. No engineer gets to decide for himself which engineering and science formulas are correct - He has to take them all as fact, or he won't get his degree. No doctor gets to decide for himself which medical procedures he or she is taught are true or not - He has to believe them all or he won't get his diploma. And Catholics as well don't get to decide which teachings of the Catholic Church are true or not. We have to believe them all if we are real Catholics. The Holy Spirit is guiding The Catholic Church, and if you disagree with the official teachings of the magesterium, then you believe that the Holy Spirit is wrong and you are right! If you want to go to the moon, you have to go to Cape Canaveral and do everything that NASA tells you to do. If a Catholic wants to go to heaven, he has to go to the Catholic Church and believe and do what the church teaches. It's just that simple. Cafeteria Catholics can be saved of course, but purgatory is very painful. Deuteronomy 11:13-17:"And if you will obey my commandments which I command you this day, to love the LORD your God, and to serve him with all your heart and with all your soul, he will give the rain for your land in its season, the early rain and the later rain, that you may gather in your grain and your wine and your oil. And he will give grass in your fields for your cattle, and you shall eat and be full. Take heed lest your heart be deceived, and you turn aside and serve other gods and worship them, and the anger of the LORD be kindled against you, and he shut up the heavens, so that there be no rain, and the land yield no fruit, and you perish quickly off the good land which the LORD gives you. Deuteronomy 28:15: "But if you will not obey the voice of the LORD your God or be careful to do all his commandments and his statutes which I command you this day, then all these curses shall come upon you and overtake you. Leviticus 26:3-4:"If you walk in my statutes and observe my commandments and do them, then I will give you your rains in their season, and the land shall yield its increase, and the trees of the field shall yield their fruit." 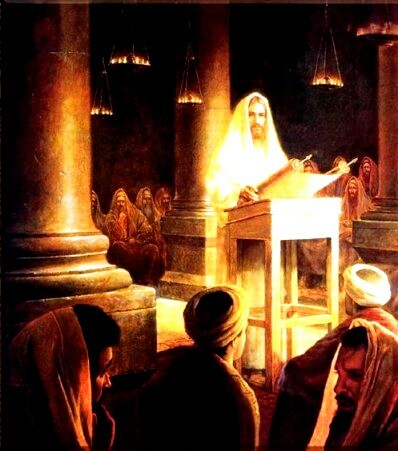 Exodus 24:7: Then he took the book of the covenant, and read it in the hearing of the people; and they said, "All that the LORD has spoken we will do, and we will be obedient." Joshua 22:5: Take good care to observe the commandment and the law which Moses the servant of the LORD commanded you, to love the LORD your God, and to walk in all his ways, and to keep his commandments, and to cleave to him, and to serve him with all your heart and with all your soul." Matthew 16:18: And I tell you, you are Peter, and on this rock I will build my church, and the gates of hell shall not prevail against it. Matthew 28:19-20: Go therefore and make disciples of all nations, baptizing them in the name of the Father and of the Son and of the Holy Spirit, teaching them to observe all that I have commanded you; and lo, I am with you always, to the close of the age." John 16:13: When the Spirit of truth comes, he will guide you into all the truth; for he will not speak on his own authority, but whatever he hears he will speak, and he will declare to you the things that re to come. 2 Thessalonians 2:15: So then, brethren, stand firm and hold to the traditions which you were taught by us, either by word of mouth or by letter. 1 Peter 1:22: Having purified your souls by your obedience to the truth for a sincere love of the brethren, love one another earnestly from the heart.